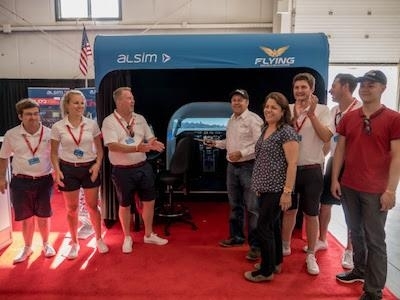 Wednesday, August 8, 2018 – Alsim is pleased to announce the AL250 simulator that was on display during EAA AirVenture Oshkosh 2018 is going Colombian flight school, Escuela de Aviacion Flying. Captain Fabio Montoya, the school’s Managing Director, accepted the AL250 at Alsim’s booth during a ribbon cutting ceremony. It will be installed in early September. Captain Fabio Montoya, Escuela de Aviacion Flying’s Managing Director, explains the reasons why they chose Alsim’s AL250, “We are proud to have a compact simulator, approved to accurately simulate PBN/LNAV (Performance Based Navigation/Lateral Navigation), LNAV/VNAV and LPV (Localizer Performance with Vertical Guidance) operations," he said. "